If Nottingham Forest are to be promoted this season, Martin O’Neill will have to perform a miracle to make it happen. The Irishman took charge of the Reds for the very first time on Saturday, but it ended in a lacklustre defeat to Bristol City. Unfortunately, the game failed to live up to the occasion itself, where a packed City Ground proudly held scarfs aloft as the legend made his way from the tunnel to the dugout. The new manager only had a few days to work with his players before putting them into battle against Bristol City. And the former Republic of Ireland supremo was quick to change the formation of the side, opting for 4-4-2 as opposed to the 4-2-3-1 deployed by the previous two managers of the club. The change of system alone was enough to spark a series of pre and post match debates, but regardless of playing two up front the Reds were somewhat toothless for most of the game. From my position in the commentary box it was clear to see that Forest’s biggest flaw was the link between midfield and attack. The match bore striking similarities to Aitor karanka’s first game in charge, almost a year ago to the day. That one nil reverse against Aston Villa was just as flat and devoid of quality as the Bristol game. But, just like in 2018, it exposes the enormity of the task ahead for the newly appointed gaffer. Usually, I’d refer to the number of injuries and suspensions that once again forced Forest into some unorthodox positioning of their players. But Bristol were also obliged to make no fewer than four changes for the trip to Nottingham, thus making it a pretty fair contest. It was interesting to see Joao Carvalho on the substitutes bench for the second week running, and even more so to see him overlooked as Adlene Guedioura and Gil Dias entered the fray in the second half. Personally, Carvalho would have been a better option given the limited supply to the front two. The 21 year old is a player of tremendous ability and one that has divided opinion of late. If I had to sum up his contribution to the side in just one word, it would be decent. For me, at the age of 21 he is work in progress and far from the finished article. There was also a debut for a player that a lot of our supporters wrote off prior to seeing him play, Yohan Benalouane. The big Tunisian became O’Neill’s first signing and was the man of the match in my opinion, he cut a commanding figure in the heart of the Reds defence and has set a standard for himself to adhere to. I could pontificate upon Saturday’s defeat in greater depth but that’s already been done by every man and his dog on Twitter. And besides, we’ve witnessed a mere 90 minutes of football from a manager that’s not even been in the job a week. As I said in last week’s piece and again on social media after the game, I’m happy to reserve my judgment on the manager until May of this year. I’m fully aware that Martin O’Neill will still have to win over factions of the NFFC fanbase, mainly our Irish contingent if I’m completely honest. Also, those who harbor doubts about the integrity of Evangelos Marinakis. I’ve already read several passages likening O’Neill to a Dinosaur and even being labelled as an analog man in a digital age! But again, as I said last week, time will tell. It will be very interesting to see how well the new gaffer will be backed in what remains of the January transfer window, and the calibre of player he goes for. If Martin’s blueprint is indeed 4-4-2 then we could expect to see an influx of bodies to suit that very system. James McLean may well be one of those coming in, a player that would give us attacking flair on both wings and allow us to be less reliant on Joe Lolley, a man who looks a little jaded of late it must be said. Forest have suffered five league defeats in their last eight games and won just one in the process, which has left them seven points from the play offs and in twelfth position in the table. 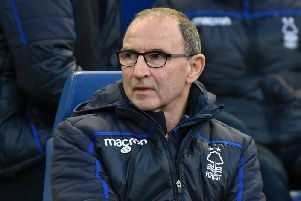 It’s fair to say that if Martin O’Neill gets Forest promoted this season, it will be nothing short of a miracle given the enormity of the task ahead.